Mira Rajput's maternity wardrobe woes are every mother-to-be, actually. Mira Rajput, who is pregnant with her second baby, shared a glimpse of the many experiences and physical changes she's witnessing as a pregnant mother on her Instagram story. Particularly, she is appears to be in dilemma whether to redo her wardrobe just yet or not. 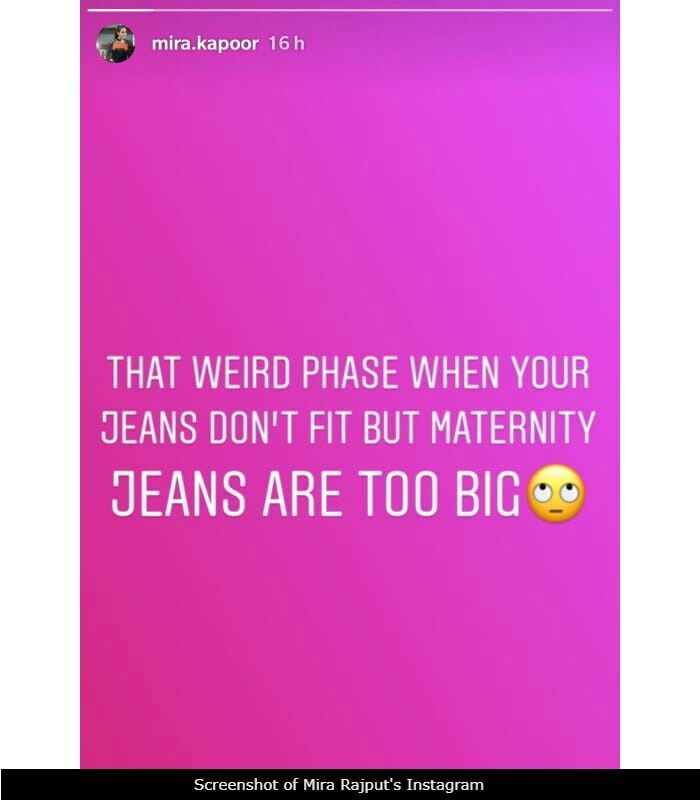 "That weird phase when your jeans don't fit but maternity jeans are too big," is what she uploaded on Tuesday night. Shahid Kapoor announced Mira Rajput's second pregnancy with an adorable Instagram post in April. He Instagrammed a photo of one-year-old Misha, which said "big sister." After the pregnancy announcement, Mira Kapoor is spotted across Mumbai only very rarely. On Tuesday night, Shahid and Mira were photographed dining at a Bandra eatery. From the photos doing the rounds on social media, it appeared that Shahid escorted Mira to the car in a hurry before taking off. Shahid Kapoor and Mira Rajput married in July 2015 and Misha was born in August 26 the next year. In July last year, Mira Rajput was asked about joining work and if there's a timeline she's looking at when she told mid-day: "No, because I am going to have another baby, and then decide." In an interview with GQ in February last year, Shahid said that Mira "would prefer to have a second kid soon as well. She wants to flip the norm, get the kids to a certain age and then be free to do what she likes." On the work front, Shahid will resume shooting of Batti Gul Meter Chalu. He was last seen in Sanjay Leela Bhansali's Padmaavat.